Unemployment has always been a part of the story of working people, and for people with disabilities and other problems the challenges are often overwhelming. Efforts to help often start in times of crisis but then fade over time; both private and government programs have assumed some responsibility for some people some of the time. Goodwill Industries, celebrating its 100th anniversary in May 2002, has always emphasized self-help as the way to improve the lives of disadvantaged and disabled individuals. Communicating its mission with strong graphic art, Goodwill has reached out to those in need and garnered support from those more fortunate, as these highlights from its collection illustrate. Founded in Boston by a Methodist minister, Reverend Edgar Helms, the organization's initial idea was so successful it remains the heart of the organization one hundred years later. The philosophy was to give people "a hand up, not a handout," and the mechanism was simple: collect used household goods and clothing from wealthy people, train and hire poor people to repair them, and sell them in retail stores. Cover of The Goodwill from 1924 showing an imposing lady-bountiful figure with a goodwill halo/hat, collecting chairs and clothing in a goodwill bag with one hand and offering help to poor urban immigrants with the other. She helps by giving them a boost up the first and highest step. The steps lead up in the world, from "Food" to " Shelter" to "Work" through "Training," and "Character" to the top ---"Independence." The clothing and even the posture of the immigrant figure improves as he climbs the steps, which appear to lead out of a busy tenement district and into a rural scene with a factory and its smokestacks prominently featured. "Not a charity but a chance," Goodwill pamphlet illustrated by Bob Day Art Supplies, Glenside, PA. Some years later the Old York Road Sheltered Workshop Committee of the Philadelphia Goodwill put together this pamphlet on the same theme. The illustration shows a man working, wearing safety glasses and work clothes, using a wrench to fix a small machine. The initial focus of Goodwill was on the poor, but by the 1930s they were expanding their efforts to work with handicapped people. "Not a coin in his hat but a tool in his hand," Goodwill pamphlet. Employment opportunities rather than charity is the theme, and Goodwill worked hard at finding both slogans and graphics to illustrate it. In this simple pamphlet the hand extending the rumpled hat for a handout lacks muscles and the sleeve is ragged, the button undone. The hand holding the hammer is active and strong. "The Paycheck," by Norman Rockwell, 1950s. Norman Rockwell gave Goodwill this painting in celebration of their fiftieth anniversary. 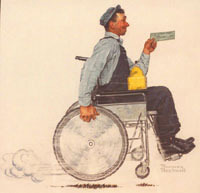 The wheelchair-bound worker, wearing work overalls and cap and carrying his metal lunchbox, smiles with delight at the paycheck in his hand. The other hand turns the chair's wheel, with such power that he kicks up dust as he speeds along. The smiling 'g' designed by Joseph Selame. Created in the 1960s by Boston designer Joseph Selame, the "smiling g" became a widely recognized symbol for Goodwill Industries. "Believe in the Power of Work," Drew Struzan, 2001. Hoping to mark the 100th anniversary with a popular image to follow Norman Rockwell's 50th anniversary design, Goodwill commissioned this work with three sections from noted poster artist Drew Struzan. "Community" (section of "Believe in the Power of Work") Work enables individuals to contribute to the economic and social vitality of the community. Note the Goodwill store and the uniformed veteran in a wheelchair. The young child with a leg brace is atop a 1950s Milton Caniff cartoon of "Good Willy" showing a youngster racing off in a wheelchair. "Independence" (section of "Believe in the Power of Work") Work gives the satisfaction and freedom of self-support. Note the "smiling g" on the pocket of man with a tie, the historic Goodwill Industries truck with the slogan "Not charity but a chance," and the use of technology to allow disabled people to be productive. "Dignity" (section of "Believe in the Power of Work") Work fosters self-esteem and the pride of accomplishment. The children's t-shirts have a "Believe in the power of work" slogan. Note the historic image of men in caps lining up at the Goodwill Industries headquarters. The centennial art closely matches Goodwill's mission in the new century: the image is an inclusive one, depicting elderly people family groups, a uniformed officer, a range of ethnicities, a range of disabilities and a range of jobs. Images from the past play an important role. The founding mission remains, in an organization that currently has over $1.9 billion in revenues, serves over half a million people with its programs, and has launched an international work initiative through its network of 209 community-based agencies in the United States, Canada and 22 other countries.